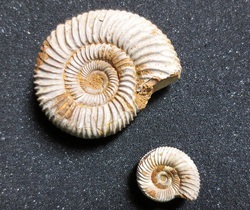 Ammonite shell, avg. size 3/4" to 1-1/2" SD. Well Preserved Ammonite with iridescent shell 1"-2" package of one Madagascar. mixed species from Morocco, Cut and polished, both halves showing calcite replaced chambers . Madagascar. tube-shelled ammonite showing excellent sutures. avg size 2"-2 1/2", polished. Highly polished nautiloid to show chambers, in dark matrix, avg. size 2 1/2"-3". Morocco. Display quality goniatites; polished to show excellent color, detail and suture pattern. avg. size 3-5". display-quality goniatites; polished; excellent color, detail and patterning. straight nautiloid shell, avg. size 2" to 3". 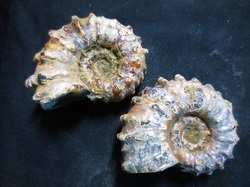 Well preserved, large ammonite with distinctive finely ribbed shell. Madagascar. 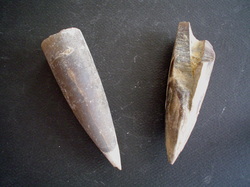 thick walled belemnite rostrum ; Various US locals; 2" plus each.